The MIDAC M4500 series is an ideal solution for dedicated instrumentation and custom sampling configurations. Adapting a conventional laboratory FTIR loaded with instrument features you simply don't use is costly, difficult, and complicated for novice and expert alike. 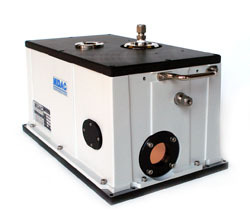 The MIDAC M4500 series is an ideal solution for dedicated instrumentation and custom sampling configurations. Adapting a conventional laboratory FTIR to these tasks can lead to compromises in performance, awkward and unreliable mechanical fixes, and costly instrument features you simply don't use. The M4500 eliminates all these problems. It's a compact, high performance FTIR module that easily and efficiently integrates with sample interfaces in virtually any configuration.